1 There were only two of them. 2 Just two words on the page. 3 Justin didn't know what they meant. They made him feel afraid, though. He didn't even know why. How could words make you feel afraid? 4 He looked at the paper again. He had found it in his locker. Someone had written those two words on the page. The paper had been folded into a tiny square. It had been pushed through the vent holes in the top of his locker. 5 Who had written those two words? Why had they put the paper in his locker? What did those words mean? 7 That's what it said. NEVER AGAIN. 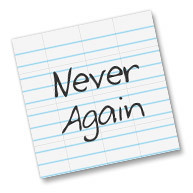 Never again what? Was it something he wasn't supposed to do again? Was it something that would never happen again? 8 Justin couldn't figure it out. All he knew was that it made him feel creepy. 9 He folded the paper back into a little square and put it in his backpack. He closed his locker door and walked quickly through the dark gym. It had been a long practice and he had a long walk home. 10 The sky was darker than usual. Thick black clouds covered the moon and stars. The streetlights shone through the thick fog. They would light his way for a while. After the streetlights ended, though, Justin had a long walk past old, crumbling buildings and yards overgrown with weeds. 11 Justin pulled his backpack onto his shoulders and started to walk. He didn't know why he felt so afraid. He wasn't afraid of the dark. The fog wasn't scary. He had walked past those old buildings before. It was that stupid note. The note made him feel afraid. 12 Justin came to the end of the streetlights very quickly. He stepped across a puddle into the darkness.